Andersson began his involvement in motorsport as a rallly driver at the wheel of his own Saab in 1962 and worked his way up through the ranks before being hired to drive by the Lancia works team in 1967, driving the Fulvia to victory on the Spanish Rally. 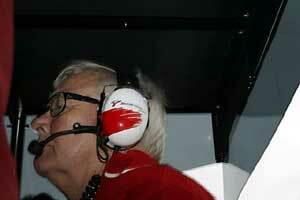 He also competed in occasional sports car events including the 1967 Targa Florio and the 1968 Daytona 24 Hours. His first major rallying victory did not come however until he joined the Alpine Renault team and won the Monte Carlo Rally of 1971. The following year he won the European Championship and he remained with the team in 1973 (when he had Jean Todt as his co-driver on several events). In 1972 he had started his own Andersson Motorsport team in his home town of Uppsala, preparing the Toyota 1600GT for international rallying. This made its on the RAC Rally that year and finished ninth overall. Andersson continued to drive for other manufacturers and in 1975 he finally won a World Championship event, taking victory on the Safari Rally in a Peugeot. That year Hannu Mikkola gave Toyota its first WRC win on the 1000 Lakes Rally and Andersson moved his team from Uppsala to Brussels where it became Toyota Team Europe. Andersson retired from competition and concentrated on building up the team, which moved to Cologne in 1979. There were occasional wins in the 1980s when Toyota concentrated on the Safari Rally but in 1990s TTE became the force to be reckoned with in the World Rally Championship winning the World Championship with Carlos Sainz in 1990 and 1992. In 1993 Toyota bought the company from Andersson but he stayed on and when Toyoat quit rallying in 1999 the team had collected 43 wins, four Drivers' and three Manufacturers' titles. In 1997 Toyota began work to design and build a Toyota sportscar for the Le Mans 24 Hours and the cars figured strongly in 1998 and 1999 but after that the focus switched to a Formula 1 effort and the company was renamed Toyota Motorsport GmbH. The team entered F1 in 2002 with Andersson still at the helm. He retired at the end of 2003 but remained a consultant to the team. At the start of 2008 he moved to South Africa. In June he was taking part in South Africa's Continental Milligan Vintage Trial, driving a 1957 Volvo 444, when an oncoming vehicle pulled out from behind a truck. There was a head-on collision and Andersson was killed instantly.